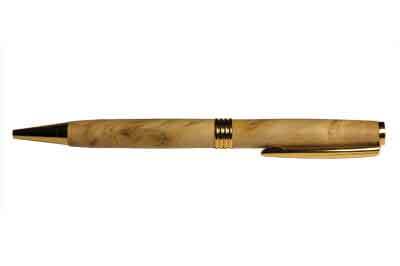 Like many pen makers, I use a range of different finishes on my pens but am constantly on the lookout for new and better ways of creating an attractive, hard-wearing surface. In particular, I would like to find an alternative to using cyanoacrylate adhesive (CA) as a finish as I find the potentially hazardous fumes from it unpleasant to work with. Drechseln und Mehr (D&M) pen finish is, in my opinion, a step in the right direction towards achieving this but does not go all the way for a couple of reasons, as I will explain. D&M pen finish is described by the manufacturers as a special surface finish, which was developed to meet the highest demands of professional pen makers. It is crystal clear, resistant to scratches, impacts and abrasions as well as being waterproof and UV-resistant. It is also toy safe and complies with EN 71-3. I found application to be very easy and the finish can either be applied to bare wood or on top of a suitable sanding sealer. The first coat is applied using a lint-free cloth or paper towel and must be left to dry for five minutes before applying a second coat, which must then be left to harden for 10 minutes. 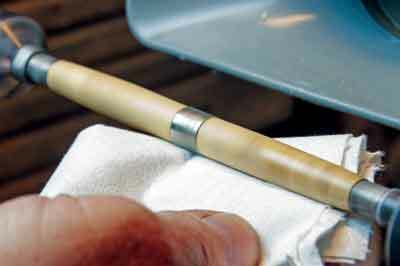 Two coats will give an attractive satin finish, further coats will increase the level of gloss, but will not give a high gloss finish so therefore this is not a suitable CA replacement for those who want a high degree of shine on their pens. 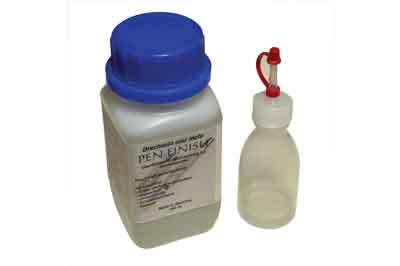 For most amateur pen makers, the total of 15 minutes drying time for two coats will not be an issue, but for anyone making batches of pens in production runs this could be an important limitation. Once dry, however, the finish is ready for immediate use without further treatment and produces a hard-wearing surface that is pleasant to the touch and should appeal to those who wish to achieve a finish similar to a natural wood surface. This product is one that I will definitely be adding to my range of finishing options. If a high gloss version were to become available, it could easily become my preferred finish.